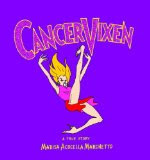 Cancer Vixen is a colorful comic book and autobiography about the author's journey overcoming breast cancer. I bet this book is really entertaining and endearing to women who have or have had breast cancer, but I simply couldn't get into it. People may read my opinion and say I'm heartless, but this book is just too depressing for someone without cancer. I had no desire to read it at all. I'm also against modern medicine and think chemotherapy is propaganda in a country that focuses on maximizing profits for some corporations due to specific government ties. I have nothing negative to say about the author, but I just simply wasn't interested in this book after the first few pages. Best of luck to the next reader!